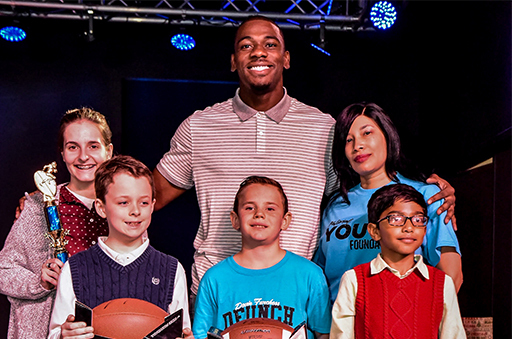 WASHINGTON, D.C. – Devin Funchess has been named Week 16 NFLPA Community MVP for holding a weekend of community events, including a charity cooking competition, a student essay contest on kindness and two toy drives. The Panthers wide receiver channeled his love for cooking into a charitable event on Dec. 21 that positively impacted many within the Charlotte community. In partnering with The National Youth Foundation, “Cooking With Funchess” benefitted the lives of children through creative educational programming. The friendly competition among 20 local chefs gave attendees the opportunity to sample and vote on an array of “pre-game” appetizers, “gameday" main dishes, “sideline” side dishes and “end zone” desserts. Among the food and music entertainment, one area of the venue honored two local heroes from the police department and United States Marine Corps for their acts of service. To get students involved, Funchess held “The Campaign of Kindness” essay contest for Charlotte Mecklenburg School district children. The 121 participants wrote 1-2 page essays on how people can show kindness to others. The four winners were honored at the event and received prizes including autographed footballs, gift cards and tickets to the Dec. 23 Panthers football game. The final component of “Cooking With Funchess” encouraged all attendees to bring new, unwrapped toys or drop them off beforehand at designated locations. On Dec. 22, Funchess hosted two toy drives during which 400 toys and bikes either donated by others or bought by Funchess were distributed to kids and families in need via Kids First of the Carolinas. In honor of Funchess being named this week’s Community MVP, the NFLPA will make a $10,000 contribution to his foundation or charity of choice along with an in-kind donation to him on behalf of our supporting partner Delta Private Jets. A limited-edition bobblehead will also be made of Funchess and sold by our supporting partner Forever Collectibles at foco.com. The NFLPA will donate part of the proceeds from this collector’s item to their charity or foundation of choice. Funchess, along with the other 2018 Community MVPs, will become eligible for this year’s Alan Page Community Award, which is the highest honor that the NFLPA can bestow upon a player. The NFLPA Community MVP program recognizes NFL players who are making a positive impact in their local communities. Each week during the regular season, the NFLPA will celebrate one NFL player who has demonstrated a commitment to giving back to his community. Read more about the program as well as the current and past winners.